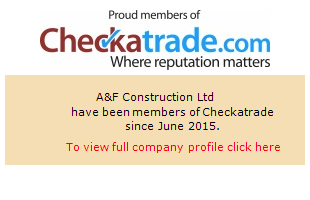 A & F Construction Ltd is a well known, local business based in Edenbridge, Kent. We pride ourselves on delivering a high standard of work at the best price possible. All build stages will be fully explained to you in plain terms so you will have full confidence and understanding of your project. Our reputation has been built on repeat recommendation from our loyal customers, so you rest assure you are in safe hands with A & F Construction Ltd .
We take pride in all our work. It makes us happy and makes our customers happy too, so come and talk to us about what your project could be. Whichever service you choose from A & F Construction Ltd, please be assured that we are fully trained to respect the environment we work within. We offer Free Quotes, Estimates and advice to all our customers, ensuring our customers peace of mind when using our services. We are fully insured, fully qualified, and only employ qualified staff.